There were a handful of good panels this year, ranging from the entertaining to the informative. The best of these, which neatly fit into both categories, was “Video Game Crash My Arse: The UK’s 80s Home Computer Boom”. This was hosted by Ben Paddon, whose name sounded familiar at the time, though I couldn’t remember where I had first heard it (later on, after a bit of searching, I was reminded of his now-defunct blog Game Journalists Are Incompetent Fuckwits, which I used to be a regular reader of). Anyway, his panel discussed everything from the original version of Elite to the proper way to pronounce “ZX Spectrum” and was exactly the sort of panel that’s my favorite at PAX: full of new-to-me tidbits about video games and very well presented. Two other panels I enjoyed were the first round of the Omegathon—dedicated to the tricky party game Taboo, which I’ve played a few times in the past at family gatherings—and “The Improvised Postmortem”, where the panelists presented fictional developer postmortems based on the titles of nonexistent games such as Tom Clancy’s Long Division and Honestly This Just Mines Cryptocurrency. Some other panels that were worth seeing included a pair on game music and audio (“Game Audio Deep Dive” and “Video Game Music Theory 101”), and two hosted by publishers (NIS America, mainly to promote SNK 40th Anniversary Collection, and Sega, who discussed their localization process with examples from the Yakuza series and Valkyria Chronicles 4). 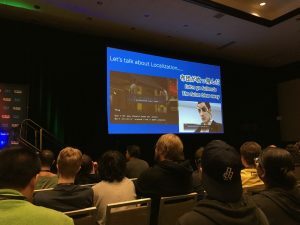 In addition to these, as well as mainstays League of Heels and Giant Bomb’s panel, there was a trip down memory lane of both good and bad video game marketing campaigns, a discussion about game preservation and what artifacts are worth holding on to, and a touching panel where developers read their letters addressed to players. 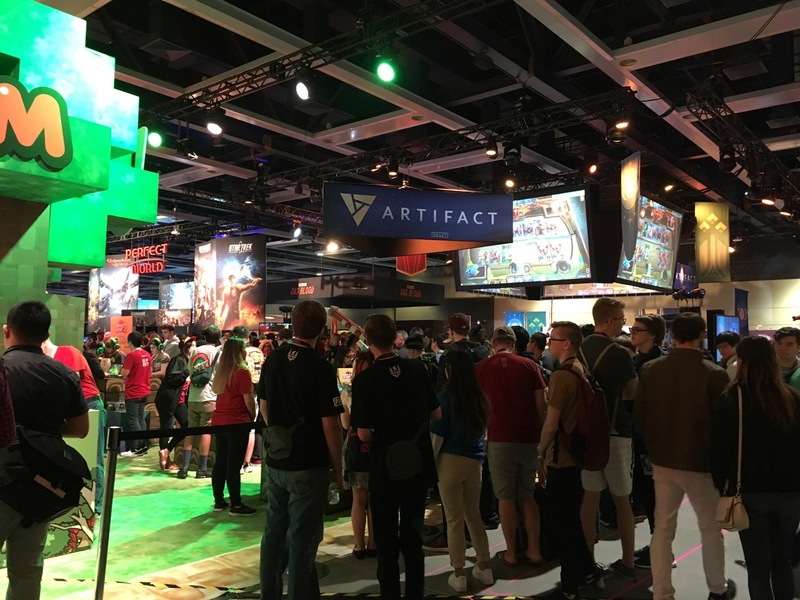 Next up, I’d like to talk about the games I saw on the show floor. Although I didn’t get to play it, one of the most inviting titles I saw—and also one of the most popular indies at the show, judging from the lines at publisher Panic’s booth—was House House’s Untitled Goose Game. This game stars a saucy goose whose goal is to misbehave as much as possible. The garden level being demoed had a set of goals for the goose to fulfill (“steal the gardener’s keys”, and the like) within a set amount of time. Seeing in person the variety of approaches one can take in doing these, along with the simple yet extremely charming premise and graphics, led me to bump Untitled Goose Game to the top of my Steam wishlist. Another game I’m hotly anticipating is Capy’s Below, which had some development setbacks but is now scheduled to come out this winter. Below is an atmospheric adventure game, and even though it already looked and played great when I had last demoed it two years ago, it’s even better now, so it seems that the extra development time was the right decision. Speaking of games that have appeared at multiple PAXes, this show was my first time playing Wattam, Keita Takahashi’s new joint about holding hands, laughing, and making friends, which publisher Annapurna Interactive featured at their booth. As one might expect from Takahashi, most famous for Katamari Damacy, Wattam has an unusual control scheme, a lovely soundtrack, and tons of positivity. There were two games that made especially strong impressions of me, in completely different ways. First up is A Duel Hand Disaster: Trackher, which had a rather inspirational setup in the Indie Megabooth. Scattered around it were various sticky notes and such which has messages such as, “MAKE/GAMES/NOT/EXCUSES”. The game itself is difficult, but unique: it’s a twin-stick shooter where two ships must be controlled simultaneously. As of this writing, it’s in Early Access and worth keeping an eye on. As for that second game, it was none other than Tetris Effect, the very same game that made game journos swoon this past E3, and after getting my hands on it for a five-minute demo, it was easy to see why. I’ll just say that I had never gotten chills playing Tetris before. Since this is currently a PS4 and PSVR exclusive, I’m very much hoping that it gets a PC release later on. Two companies’ booths I visited multiple times were NIS America’s (actually a small room in the Sheraton) and Square Enix’s. In addition to the SNK anniversary collection, NISA had demo stations for Disgaea 1 Complete—which is the same old Disgaea you know and love, but remade with crisp, high-def graphics—and the upcoming release of theirs I’ve been most curious about, Labyrinth of Refrain: Coven of Dusk. This latter game is a PS4/Switch first-person dungeon crawler from the Disgaea team, and judging from my little taste of it, it’s as complex and well-crafted as one would expect. I liked it enough that I later ordered the limited edition from NISA’s online store, along with the one for Touhou Genso Wanderer Reloaded, which I had similarly been on the fence about but was sold on after trying it out at the UNTIES booth. As for Square Enix, not only was there the spectacle of a playable Kingdom Hearts III(!!! ), but Saturday brought autograph sessions with Yuji Horii, one of the creators of the Dragon Quest series. I had somehow forgotten about this but lucked into a spot in line shortly before the last session ended. The most magical part of getting an autograph was when Horii-san asked (through a translator), after my mentioning that Dragon Quest V was my favorite, “Which one did you choose?” I knew exactly what he was talking about, but blanked on Bianca’s name and just said it was “the blonde one”! It was a little embarrassing, but Horii-san didn’t seem to mind, and after a couple of quick photos, I was once again on my way. Of course, I returned the following day to give Dragon Quest XI a whirl shortly before the Expo Hall closed for the evening. The little bit of it I got to play was classic Dragon Quest with a few new bells and whistles, and it left me confident that this would be yet another great entry in the main series. The other game I played at Square Enix’s sprawling booth would be on Monday, and, as it happened, was the very last one that we tried out on the show floor: the Final Fantasy Trading Card Game. I have never gotten into TCGs—a previous attempt to teach me the basics of Magic: The Gathering left me with my eyes glazing over—but I do like Final Fantasy quite a bit and had been a little curious about this particular incarnation of it. The guy who walked us through the rules and flow of the game did a good job of it, and the game itself is interesting enough that we’re considering picking up some cards. 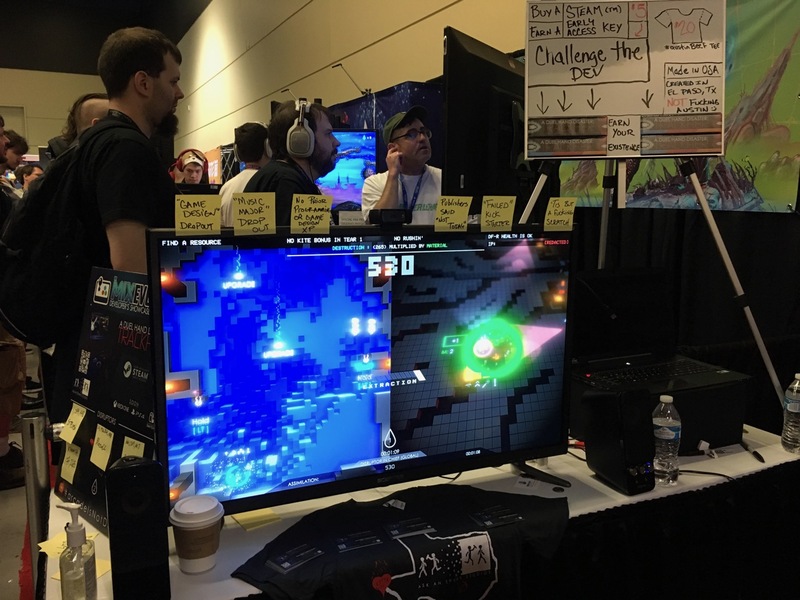 There were a few other games which caught my attention during the show, such as the bullet-hell typing title The Textorcist, the incredibly cheeky What the Golf?, and assorted others ranging from Pizza Titan Ultra and Gunhead to Devil May Cry 5 and Russian Subway Dogs. Outside of games, there was the usual vendors of game-related items to browse, though one disappointment was that Udon Entertainment didn’t bring any of their wide range of video game artbooks to sell at the show. There was also some interesting cosplay, though I didn’t take any pictures as I have in years past. 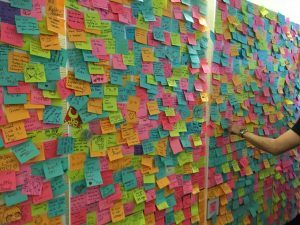 One feature of this year’s PAX West that deserves special mention is the Stickies of Support. This board was inspired by some sticky note messages that appeared in the women’s restrooms at Riot Games during the weeks before the show, as a show of encouragement for female and non-binary co-workers. These Rioters wanted to share this concept with PAX, and thus was the Stickies of Support born. 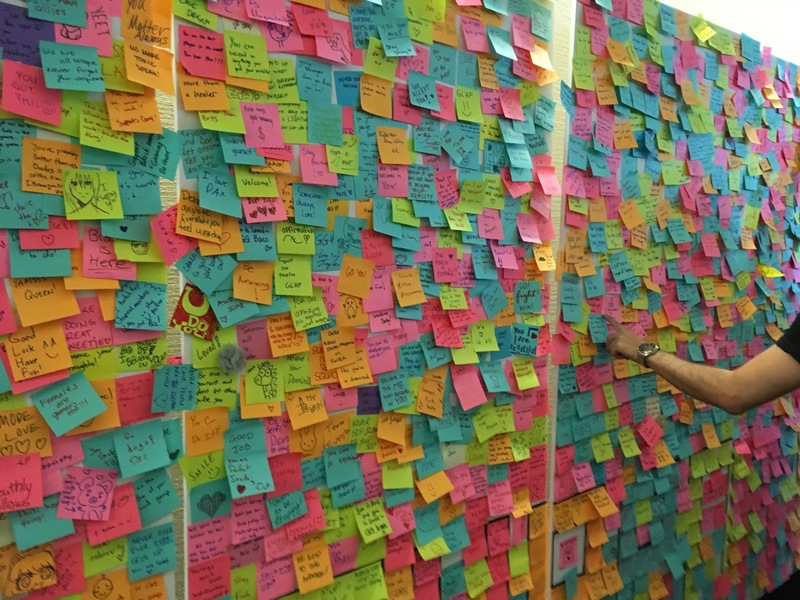 Hundreds of PAX attendees, including myself, contributed messages. It was a lovely, heartwarming thing to see, and I hope that it gives people strength as the problems over at Riot Games continue. As usual, PAX ended far too quickly, though this year, we did something different for the day after. Instead of flying straight back to San Francisco, bitprophet and I had allotted ourselves a post-PAX day in downtown Seattle, during which we walked around some touristy spots, did a little shopping, and met up with a local friend for dinner. It was a great way to unwind after the breakneck pace of the show. Of course, the day after that, we were headed for the airport, exhausted but happy, and hoping to do it all again next year.